The Royal Mint is delighted to introduce the 2009 Britannia collection, featuring Philip Nathan’s famous 1997 design of Britannia standing tall in her chariot. His stunning design appears on the reverse, while the current portrait of Her Majesty the Queen takes pride of place on the obverse – the first time that the two designs have appeared alongside each other on a gold coin. The 2009 collection is the eighth in a series of Britannia commemorative coins to be released since their inception by the Royal Mint in 1987. 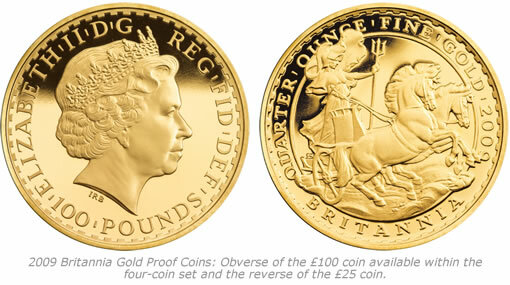 Unusually for UK gold coins, the Britannia Collection is struck to 22 carat gold Proof quality, but with a small quantity of silver added to the alloy, resulting in a brilliant yellow gold finish.